People’s perception of Africa has tremendously changed over the years mainly because it has gained prominence as a worthwhile vacation destination. Quite a number of beaches in the country beckon beach bums and wanderlusts seeking to have a good time. Cape Town, the second most populated city in Africa next to Johannesburg, is home to many breathtaking beaches. In fact, it’s famous for its harbour; thus, it is widely known as Africa’s most popular tourist destination. One of the well-known beaches in Cape Town is Boulders Beach (or Boulders Bay). It lies just around the corner from Simon’s Town. Charming and quaint are two words that may be used to describe this sheltered cove of white sand beach. Massive granite boulders are aplenty on this beach, hence, the name Boulders Beach. While most of the beaches in Cape Town have icy waters (these being part of the Atlantic Ocean), the waters of Boulders Beach are a tad warmer (the beach being on the Indian Ocean side of the peninsula). The beach is ideal for snorkeling and sheltered swimming. If you’re the type of person who likes to have a good time but want a more laid-back atmosphere, Boulders Beach is the place to go to. The charming appeal of the beach must emanate from Simon’s Town itself, which is a former navy seaport. What lure people to this place may perhaps be the giant boulders found along the beach that provide seclusion and utmost protection from the wind. Nevertheless, more than the allure of the warm waters and the appeal of the giant boulders, the beach offers something more that draws in visitors. The main residents of the beach are penguins! 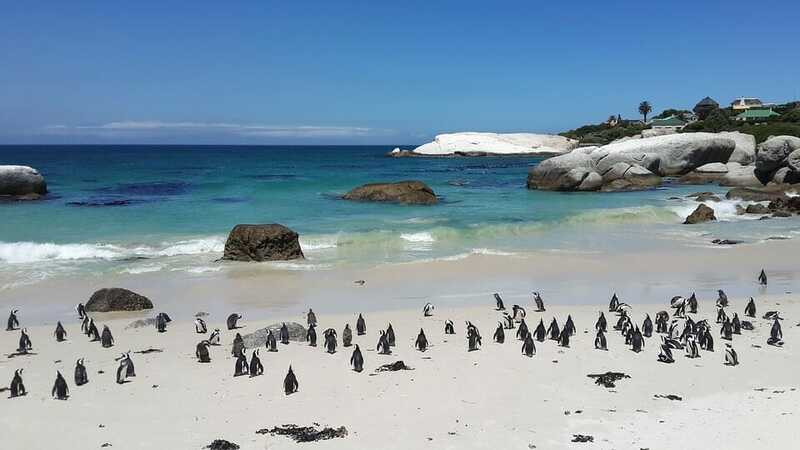 This charming beach, as well as the neighboring Foxy Beach, is home to thousands of African or Jackass penguins. Therefore, spending a day on the beach gives you an unrestricted access to the lives of these penguins. You would have a field day watching them go about their daily business – you’ll see the penguins sunning and tidying themselves, guarding their nests, waddling along the shore, and making like tuxedoed torpedoes once they set foot in the water. Can you imagine yourself sharing a stretch of sand with these tuxedoed birds? More than that, can you imagine the look on your kids’ (that is, if you’re traveling with your children) faces when they find themselves face-to-face with the penguins? Of course, you have to prepare your ears for the loud, braying cries of these penguins that are sure to remind you of donkeys. After all, they wouldn’t be called Jackass penguins for nothing. Here is a word of caution, though. Do not attempt to touch the penguins. We all know that penguins are not the friendliest of the bird family. These wouldn’t hesitate to charge at you if these feel threatened. Penguins also have very sharp beaks. You wouldn’t want to go back to your hotel with nasty pecks or worse. Admiring the penguins from a safe distance is the best way to go about it. From the lovely pics you shared, Boulders Beach does look charming and quaint with all that scattered boulders. How interesting that the main residents on the beach are penguins! I was just in Africa, but we didn’t go down that South. We had the option but we wanted to see the most animals humanly possible and we were continually recommended Kenya, so that’s where we went! But shoot. Now I want to go to Cape Town. 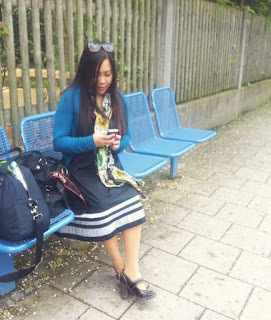 It might take me a few years to recover from the LONG flight though!